Appreciation and thanks to Glyn Hicks, Rhydwyn Harries, Chris Lloyd and Mel Senior, who have chosen to stand down, for all their hard work and support to the club over the past year(s). 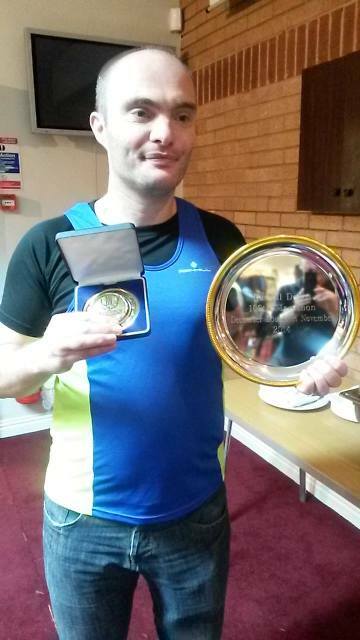 Congratulations to Russell Dobbs who recently completed his 100th marathon. Once again, a magnificent achievement! The club has taken the decision to start a beginners' group intended for people who have never run before or who have done very little running. The aim of the programme will be to help people to progress from running/walking to running 1 mile, then 2 miles, then 3 miles so that eventually they reach a position where they can comfortably run 4 miles. The group will meet every Tuesday (commencing 9th September) @ 7:00 pm, Pontllanfraith Council offices. The group will be a part of Islwyn Running Club and will be led by experienced coaches and club runners in a relaxed and informal environment. Come along and take flight! Islwyn men 1st overall in the Road race series! Sunday 19th October 2014 - Pont-y-pwl & District Runners (Pontypool Park, NP4 8AT, includes presentation for GLCL Road Race series). Sunday 16th November 2014 - Usk Runners (Venue TBA). Sunday 11th January 2015 - Islwyn (Pontllanfraith Council Offices, NP12 2YW). Sunday 15th February 2015 - Fairwater Runners (Llantarnam School, NP44 3XB). Sunday 15th March - Lliswerry Runners (Rogerstone Primary School, NP10 9YX). All races start at 11:00 a.m. Please make every effort to support your club and attend at least one (if not all!) of the above. The X/C races are great fun, honest! 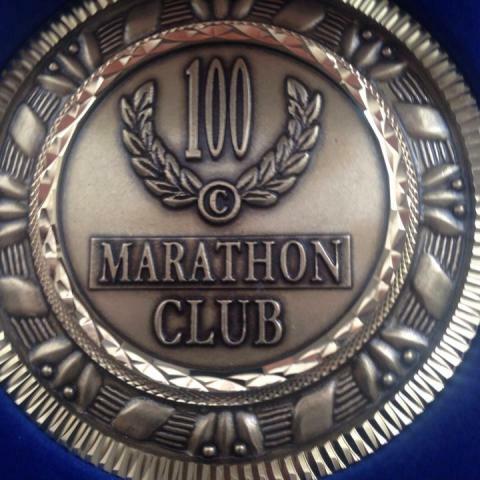 Not many people get to earn one of these, so massive congratulations go to Sean Birch who completed his 100th marathon in May! He is, like, the Dean Karnazes of the club. Magnificent achievement! 06/05/2014 - Griffithstown Harriers (The Olive Tree, Cwmbran). 27/05/2014 - Spirit of Monmouth (Trellech). 17/06/2014 - Islwyn Running Club (Parc Penallta). 15/07/2013 - Caerleon Running Club (The Wheatsheaf, Llanhennock). 05/08/2014 - Parc Bryn Bach Running Club (Parc Bryn Bach). All races to start at 7:30 p.m. Please make every effort to support your club and attend at least one (if not all!) of the above. Congratulations to Ruth Treharne and Robert Davies who both recently achieved the notable milestone of 100 park runs. Well done both! Male club champion was Haydn Hartnell, Female club champion was Melonie Senior. Most improved male athlete was Alun Wood, most improved female athlete was Kelly Waite. Awards were presented to new club captains, Chris Lloyd and Melonie Senior. Outstanding Achievement Award presented to Garfield Jones for his exploits in 24 hr and 100 mile races. There were 20 year club awards presented to Mike Dury and Daffyd Lambeth. 30 year award presented to club president and founder member Malcom Parker. New club chairman Martin Jones presented the Chairman's award to outgoing chairman Glyn Hicks, who was also made an honorary member for his outstanding contribution to Islwyn Running Club. Thanks were expressed to Coleen Birch for organising the evening, The Ynysddu Hotel for an excellent meal, Blair Lundie for sourcing the superb trophies and his work as registration secretary and Rhyd Harris for his efforts as treasurer. Good night wasn't it?